Okay this seemed a great idea initially toying with rapid production methods and agile DSDM working methods, and safe to say that yep, its work in progress. But this is what I liked so far out of all the MOOCs out there in the big world wide web. Lately I have received many updates from SkillShare to sign up. So I took a look at what they had to offer, visiting SkillShare, and this is what I saw. https://www.skillshare.com/home but you get to watch the teaser introduction and need to redeem the 1 month free subscription. Then for data protection reasons you will need to add your bank details and just in case you forget then SkillShare will bill you after you forget to cancel your 1 month free membership. Ouch that will hurt initially and will be forgotten later on your bank statement. For argument sake I took screenshots instead and that will do for me. I had a slight brainwave and realized that YouTube is a great OER video platform. But when it comes to closed captions and subtitling, they don’t score very well especially in the accessibility area. That was when I decided to look at YouTube and searched SkillShare there instead. I came across a few free videos like https://www.youtube.com/user/Skillshare. Overall I enjoyed the concept and idea behind the way the presenter creates an organised space for the learner to choose a course and to follow a learning plan. With some simple steps the learner gets a chance to navigate in screens step by step and will be able to choose a project to finalise what they learnt. After reading Downes (2001) case for learning objects it brought back my memories of working as part of the OU Anywhere team in 2012. During this time we extensively problem solved as many tagging issues as possible to ensure that the EPUB would be able to be rendered correctly. I worked as part of a closely knit team, almost like we were code making as opposed to code breaking at say Bletchley Park. But the whole operation was well organised and this always came up in my mind that would we be able to recreate this scenario again? Anyway this is a topic that I could discuss another time, for now lets look at Downes (2001) paper: Learning objects: resources for distance education worldwide. 2014: H800 TEL: practices and debates, OU module. How to become a blended learning designer, with Canvas network Blendkit15. 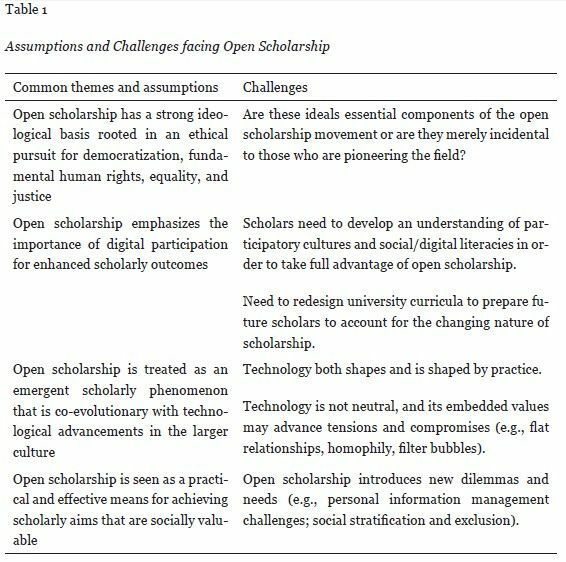 Read the George Veletsianos and Royce Kimmons paper Assumptions and Challenges of Open Scholarship. In the article the authors set out a number of common assumptions and challenges (see their Table 1 below). 1. Examine their assumptions and your own, and state the extent to which you agree with the four statements of assumptions. I partly agree and disagree with the creation of MOOC’s as a democratic way of offering a free education. As my original thought on this was that the MOOC’s main objective was to turn a student offered the opportunity to learn for free to a paying student at an educational institution. I felt that MOOC’s were seen as an offering to entice a student to eventually enrol onto a full paying qualification. I can see that projects such as TESS India, an OU project to improve the quality of teaching in both elementary and secondary schools with OER’s in hard to reach parts on India. Effectively this improves the human rights and democratizes work opportunity’s for woman in India. I agree with the ideals set out to equality in education giving everyone the equal chance and right to a common standard chance to attain an education wherever they are in the world. Within the world there is a dynamic picture based upon inequalities of rights, poverty, digital divide and cultural differences. I think this statement in the second assumption is based upon getting scholars to think about ‘Digital Literacies’ and how this can have an impact to our digital presence online. Going forward I feel that a lot of what we try to teach will need to take into account a way of quality assuring sources of information online. As it will be difficult to give a critical view on the web 2.0 in terms of what is true and what is false. The web of today is slowly filling up with a potential influx of an information overload. It’s about being able to differentiate with which information is true based upon your own critical view and understanding. Defining key information against your own set terms of criteria will be important in overcoming this. I agree that as a whole digital participation is important in the realms of understanding open scholarship. As with my own experience with teaching WordPress its important to scaffold learn together as opposed to creating a space of teacher to learner environment. With this comes a sense of roles played by both the learner and teacher. Recently I have discovered Hackday events as a way of solving a question or problem solving as a collective. The digital space could be seen as one large Hackday event where everyone collectively attains the result to solve a problem. I can associate with the idea that the filter bubbles within our own social circles on SNS can have on our views, ideas or research going unchallenged. As I have friends or connections amongst Facebook who may be seen as homophily to my own values and personality or by having the same way of thinking. With this would come a lack of diversity amongst the same group or collective as everyone would be on the same bandwidth in terms of thoughts and philosophy. Coming out of our comfort zones and challenging our fears, anxieties and weaknesses will nurture a better understanding of ourselves and allow us to build a better persona, profile or person specification. Filtering, analysing and critically understanding the validity of resources against your own personal set criteria will allow you to be able to control the amount of information that you will be faced online. On the downside of this you may not come across a different source of inspiration from an area within the same circle of friends that you reside within. You almost begin to exclude yourself to the opportunity to discover a new aspect or a new piece of information. So it would be good to keep an open mind at all times. I would see this from a personal experience that I would need to find ways of capturing relevant information to do with how I use digital technologies such as the social bookmarking tool Diigo to become more effective as both a learner and practitioner. 2. Identify examples from your personal experience that relates to any of these. 3. Post a message to your tutor group forum stating your level of agreement with each statement and sharing experience of these. If you have a blog, or other online space, you could post into this and provide a link in the forum. Since being on vacation in Canada on route to Ottawa, I thought that it would a good time to reflect on what I have learnt on the H800 module. TEL stands for technology enhanced learning, it’s the latest new word on the street or the latest buzzword that everyone is talking about. There would be too much to list here in one blog post but so far I’ll discuss the structure of the material so that you can have a clear picture of what had been learnt. Firstly the use of digital technologies in teaching and learning has both advantages and disadvantages. Research suggests that time online and offline for reflection is important. Aswell as reading books and online content or referring to an ebook, time for study on the move is important for the today’s student. So too is the need to be able to critically analyse the validity of the sources of reference material with a balanced viewpoint. Taking both sides of a theorists thinking/ arguments with quantitive and qualitative sources of data. This would negate the need to be copying content that was not from your own viewpoint. By correctly referencing your source material you will not be compromising your credibility for plagiarism. Acknowledging the primary source of all material will mean that you are able to draw knowledge from the point that you are putting across. 1 it is cheaper to present the course material online than to publish a book about the subject. This could be due to the fact that once a book is printed it is set in stone and cannot be amended. 2 the onset of online MOOCs massive open online courses meant that the cost of learning at a real university is considerably higher. MOOCs offer a cheaper alternative that makes learning more accessible to all students regardless of financial status, level of study and ability. 3 amending or redoing course material online is considerably easier to plan and create as older assets can be reused or referenced. 4 technology has moved faster towards the online world so that more of today’s Millenials are able to learn on the go with wifi connectivity at all times. A. There is a trend towards the digital divide with digital migrants unable to know how to use online resources via digital literacy. Some less fortunate family’s from poorer backgrounds are may not be able to afford internet connections. Also the more mature students are less knowledgeable on how to use computers and tablet devices. B. Information overload, means that we are unindated with information and data all the time. We as both practioners and learners will need to learn the digital skills to be able to filter out the less appropriate sources to the more applicable. And to know which ones are from true sources in terms of credibility, this will be important in terms of referencing. C. It’s change management from learning from a book in the olden days to today’s interactive ways of learning. Back in the past it was acceptable for a teacher to present a book and blackboard lecture. Now that form of teaching would be seen as ineffective, so today’s practitioners are having to create more effective ways to engage pupils into learning. 6. Evaluation and review of engagement strategies. 2. Google scholar or Digital Skills. Google scholar has weak points in terms of consolidating into an activity. What are Digital literacy/Digital skills? Explore these areas in more depth. Try searching more on social bookmarking websites, like delicious, look at the history of their developments. What is more easily shareable today compared to in the past? Catering for visually impaired to visual learners, dyslexic, dispraxia and aspergers spectrum to mental health. Able students and disabled students. Use of Daisy books, talking books and Jaws screen readers.